The 2017 Battle of the Classes Pursuit Race will feature at the Southampton Boat Show on 17th September 2017. Enter Each dinghy class will be represented by just two boats so the standard will be high, with each class competing to be the best. Previous years have seen many National and World Champions representing their respective classes. Competitors will launch from the nearby Southampton Water Activities Centre and will be competing on a tight course laid just off the Boat Show marina. With several spectator opportunities along the shore and regular updates via the Southampton Boat Show public address system, SailRacer will also be providing live GPS tracking, analysis and commentary, which will be available online (including Mobile) and on big screens around the Show Ground. 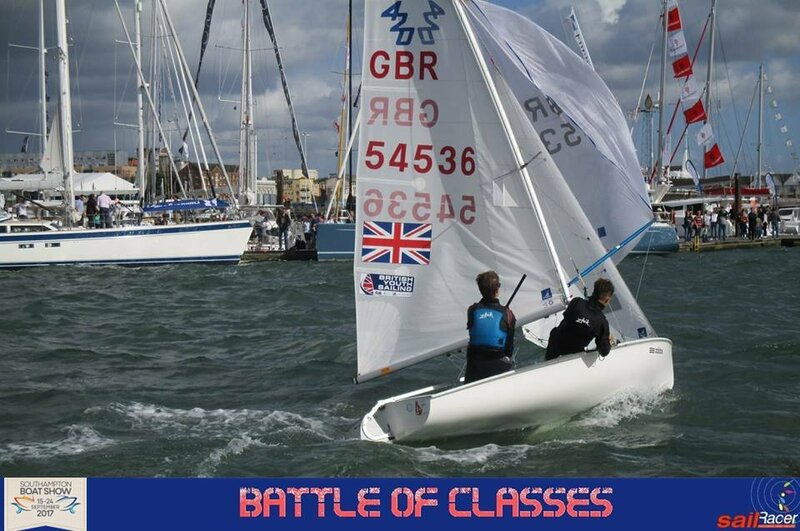 Hosted by Royal Southampton Yacht Club, the 2017 Battle of the Classes will be a great showcase of diversity of UK dinghy sailing, and a chance for each class to promote itself to a wide audience. Previous editions have seen many of the UK’s top sailors competing, including National and World Champions. Each Dinghy Class Association is invited to enter their two current best performing boats, entry is free, closing date 10 September. Each competing sailor will receive two free tickets to the Southampton Boatshow.